Operating out of a state of the art armouring facility sited at Ode-Remo, Ogun State, Nigeria, Proforce Defence are setting a new pace in the assembly of various armoured and protective products in Nigeria. 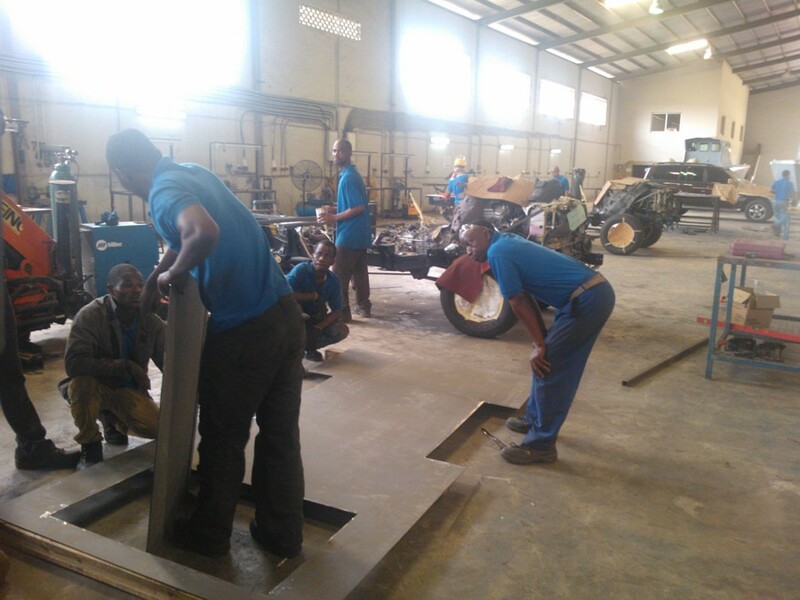 To lend credence to its organizational goal of creating a competent workforce of Nigerians, two of the armored vehicle fabrication projects now ongoing at PROFORCE amount to a competitive test of skills between two work teams – one wholly manned by Nigerians (who are producing the vehicle pictured above on the left side) while the other vehicle pictured to the right of your screen is being constructed by a wholly Filipino work team. According to the General Manager of PROFORCE DEFENCE LTD, Mr JHA Gopalji, the company’s target is to see that within the next twelve months, the process of skills impartation on Nigerian personnel is completed. Gopalji opined that with the repitition of the gamut of production processes entailed in the construction of armoured vehicles, expertise shall be attained as the Nigerian technicians and engineers apply themselves to the tasks again and again. After the armouring process has been completed, the vehicle is inspected again to test the functionality of the components, materials and electronics. Armouring also involves the installation of hardened ballistic Steel, Kevlar blankets, Dyneema, Spectra, Shield and run-flat tires . After the armouring process has been completed, a technical review process is carried out by Proforce quality control experts to ensure that the armoured vehicle meets laid down performance standards. For confirmation of stability, efficiency and general performance characteristics, an armoured vehicle is put through a road test to determine how it is likely to perform in the theatre of operations. According to Mr Gopalji, after the armoring process has been completed, part of the quality control entails among other deliverables, returning the interior to its original placement, hiding the armour and retaining the integrity of the vehicle. The armored vehicle’s suspension systems are reinforced to accommodate the weight of the armour while run-flat tyre inserts and brake upgrades are also effected. Mr Abimbola Owojori of the Strategic Research and Development Unit who took this writer on a guided tour around the premises and factory floor had earlier indicated that a good deal of the Nigerian technicians are products of the nearby Gateway Polytechnic who have completed their Ordinary National Diploma curriculum and have attained an advanced stage in the development of correct balance of engineering theory and practice, being conistently imbued with knowledge, skills and aptitudes necessary for the long-term viability of Nigeria’s budding armoured vehicle construction industry. 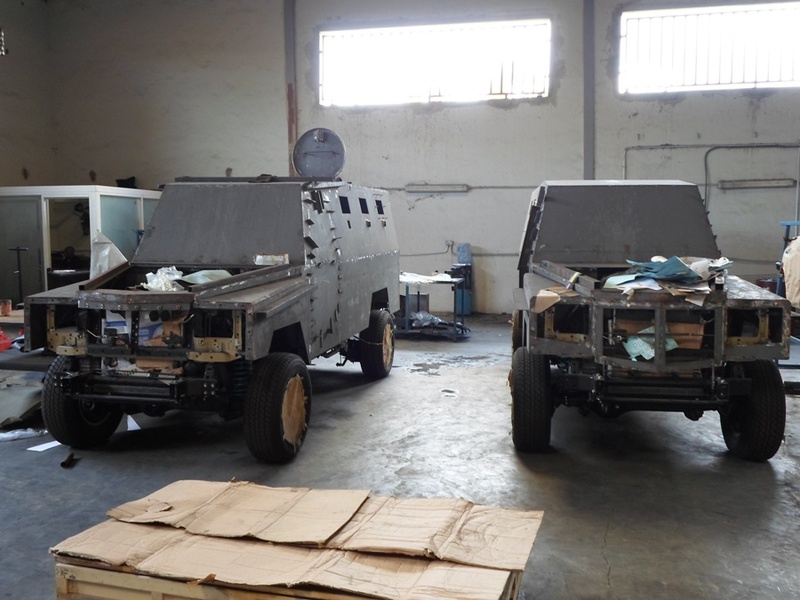 True to one’s hunches, this writer was pleased to learn from Mr Owojori that Proforce Armoured Patrol and Combat Vehicles are fabricated on the driveline of the legendary Toyota Landcruiser, the precise variant which has lately been configured as gun-trucks and deployed operationally in Mali and in NE Nigeria for combat operations. What this means is that Proforce Armoured Patrol and Combat Vehicles use Commercial-Off-The-Shelf (COTS) accessories which bodes well for interoperability with the Landcruiser gun-trucks of the Nigerian Army, and for logistics and maintenance support. It also indicates that the PROFORCE Armoured Patrol and Combat Vehicles are fully desert warfare-compliant, with the full entailment of rugged components and traction. Not to mention operations in more benign climes. At that point, one really could not help but imagine PROFORCE armoured combat vehicles rolling alongside Landcruiser gun-trucks, Panhard VBL scout cars and Otokar Cobra APCs on combat operations in Northeast Nigeria and in Mali. Not to mention the glorious feeling of seeing PROFORCE armoured patrol and combat vehicles driving past in Liberia and Darfur and global military contingents getting told that those beautiful vehicles were made in Nigeria. I smiled broadly. New vistas beckon. Sales & Marketing Office: 11 Porto Novo Street, Off Aminu Kano Way, Wuse 2, Abuja. Vision Statement: To be the leading Armouring and Defence Products Service Provider in the World. Business Definition: Delivering Confidence in Personal and Protective Mobility. Proforce Limited is a total defence solution provider specialising in Armoured Vehicles and Body Armour. Proforce has within a short time developed a vibrant market for security and mobile protective products that cuts across Africa. It is exploiting its deep technical know-how to produce outstanding armoured products for the Military, the Police, Corporate Organisations, Diplomatic Communities, Government Security Agencies and VIPs. Guided by technical innovation and a State-of-the-art defence automotive assembly plant in Nigeria, Proforce Limited is a global player in tactical, military and personal defence products. PROFORCE LIMITED offers the set skills required to keep private citizens, Government Officials and Law Enforcement Agents safe and prepared against conceivable security threats at any point. PROFORCE designers and engineers have 65 years cumulative experience in the unique designs and manufacturing of SUVs, tactical military vehicles, and passenger cars currently used in some of the most hostile regions. PROFORCE LIMITED provides highly secured Cash-in-Transit vehicles for Financial Institutions and cash-movement agencies requiring safe movement of money and goods in urban communities and hostile urban territories particularly in Nigeria. • With our state-of-the-art armouring facility in Ode-Remo, Ogun State, Proforce Limited is setting a new pace in the production of various armoured and protective vehicles and products in Nigeria. • Proforce is constantly able to meet local and international needs, without our clients (private and government) having to step out of the shores of Nigeria, while making sure that every sale is backed-up with unique and immediate after sales services and maintenance, saving you executive-business time and foreign exchange. Corporate Head Office: 54 Balarabe Musa Crescent, Off Samuel Manuwa Street, Victoria Island, Lagos. what a marvel to the eye. our taste for foreign goods should start declining. ministries of defence and police place your orders!! head of police reforms, mike okiro, should be taking note with a keen interest in procurement. I would say that Nigeria has no reason to import non specialised APCs anymore. Order 2000 of this vehicles and see the defence sector mature before your very eyes. You are going to be stunned breathless. We shall start from the lower end of spectrum to post photos of these armoured vehicles and conclude with the armoured combat vehicle – a warrior in itself. We shall serve you the juice everyday right through to the weekend. You need to see how an armed security operative looks in one of them so that we realise how so good to go we are. It is up to the Office of the NSA, the Defence Ministry, Police Affairs Ministry, DICON and DHQ to come together and merge the efforts of PROFORCE, NAEME and DICON towards perfecting the work on all Made-in-Nigeria armoured vehicles. PROFORCE come to the board with the business acumen of private sector operators. The FG need to place orders, allow them to develop absolute expertise on these systems, improve them as they go on, make the ventures viable on account of patronage and then, because we use them too, CTCOIN-challenged African countries looking for right-priced options (think Mali, Chad, Niger for a start) can be expected to follow suit. Let us make sure that this all WORKS out for good. Long live the Federal Republic of Nigeria. So oga beeg, you mean it is christmas already. Eagerly anticipating!!! This is a national pride. Beegeagle is this in Naija ? Surprised to see Filipinos working with Nigerians at Proforce. They are probably working before with Asian Armored Technologies (Philippine company that built the GKN Simba IFV) or those in the civilian armored vehicle markets. I’m proud to know my countrymen are working with you guys! Fine, fine here General. Just came from some regional travel again, losing time to write in the blog. Do you a projected number of units to be built for the NA? Are the police also getting this armored vehicle? Was it design with MRAP in mind? Yes Filipinos are everywhere, last time I checked there is also in the Antarctic and Arctic areas, far from the usual tropics with coconut trees haha! @MAX, this should not be a surprise, as nigeria has a sizeable filipino expat community. With most of them in the shipping and marine industry. One of our strongest manpower assets are in shipping and marine, funny since our navy is not in the forefront hahaha! eyimola and henry, its good to know that we are working together there, the Philippines is actually home to a sizeable Nigerian student population as well. Nigerians constitute the largest African population in the Philippines, mostly in Manila. These students later go to the West or back to Nigeria to apply their education for helping Nigeria in the long run. This is Ode Remo, OGUN STATE. It is situated off the Lagos-Ibadan and Lagos-Benin Expressways, five miles from Sagamu. Whaoo…. Impressive! Now our soldiers and police operatives in the frontlines don’t have to die in those “certain death” soft bodied Hilux vans assaulting the eyes and sensibilities. Again, these PROFORCE products are not prohibitively priced unlike the imported variants. Therefore, those at the levers of authorities should promptly commission PROFORCE along side DICON to produce these protective vehicles, in joint collaboration, in large number for our boys paying the ultimate price for Country and Honour. With a stroke of the pen they would have provided answers to many issues: (1) Job creation. (2) Equipping the Services with sorely needed hardware. (3) Encourage the transfered knowledge to bed-in to a point it is entirely local oriented in design and fabrication. (4) Save on foreign exchange. (5) Self-reliant in this grade of hardware. (6) Sell finished products to neighbouring countries. It is win win win for all. And guess what? I shall be posting their most basic APV first. By the time that you get to see the other two in the array – one an armoured carrier and the other, a plucky armoured combat vehicle, una go holler! Nigerians in Nigeria, in the UK, in South Africa, in the USA, civilian and military alike..Beegeagle’s Bloggers all saying ‘kudos’. Keep it up, PROFORCE. Oga Akin, you could not have said it any better. If not for the fact that PROFORCE DEFENCE, may not be able to meet local demand in this class, I would have suggested FGN should ban the importation of this class of APV. A partial ban to be honest, should be the right way to go at the moment. I see your point Oga Henry. Here is the sequence, Akin. Starting with their earliest fabrication, the base model PF2 APV, we shall present world exclusive photos tonight (as against the original plan for tomorrow). The PF2 would complement the armoured Landrover being used by the Police in Borno at this time. Tomorrow, you shall see the more militarised PF2 Mk.II, a fine modification of the base model which would work well alongside Landcruiser gun trucks, Panhard VBLs, uparmoured Pinzgauer ATVs and Otokar Cobra APCs in a broad spectrum CTCOIN and desert operations-compliant array. Come Wednesday by God’s grace, you shall get to see the jaw-dropping Armoured Combat Vehicle which is an all-out combat vehicle. Oga Beeg, I am already quaking with anticipation. Kai… Don’t punish us too harshly by holding out too long Oooo… Abeg Oooo… Lol… Wonderful efforts as always. Stay Blessed Sir. Believe me, their next stated objectives are the fabrication of an armoured tank here in Nigeria and the completion of further development work on their PF1 APC. Good job Beeg, were you able to find out where they source their materials, armor plates etc? Moving away from security to civilian issues, there’s also Innoson Motor Vehicles Manufacturing Company in Anambra who has been doing a great deal of work in the local auto industry. He’s been seeking government patronage for a while now. He actaully has goverment patronage by way of finance and purchase(innoson i mean)….its relaible info from me as an auditor of one of the audit firms in Nigeria. Thats why i was asking beeg if they (Proforce) have government patronage cause i have never come across any record of Proforce sourcing loans from the top govenment industrial finance bank. Last year, they won an order from the Osun State Govt for internal security vehicles which are oriented towards policing missions. From the base model PF2 APV, they have developed two militarised variants which you shall get to see tomorrow and the next. The PF2 APV( the hilux), I’ve seen a couple in port-harcourt. I also know that the IGP also purchased a few for patrols on benin-ore-shagamu road. My brother, indigenous capacity building through government support and patronage sets the pace for development. Boko haram somehow arose the sleeping giant from years of slumber. Is PROFORCE a Nigerian company? There are other organisations with this name including some who I believe also specialise in defence. Yes. The proprietor owns a string of other businesses in a nine-company group, one of which is the Ikoyi Vaults and Gardens where the mortal remains of the rich get interred in Lagos. He is a graduate of the University of Lagos. Here is the foundational APV that is the PF2. From this, a sterner upgrade – the PF2 Mk.II and a militarised Armoured Combat Vehicle have emerged – complete with a 360-degree turret fabricated from start to finish in Nigeria. Gen Beeg…Nna the guy na akokite sef..More grease to your elbow fellow Akokite!! Well its good that you are carrying this mission on this blog. The market for these armored cars far exceed Nigeria alone. It would be cheaper for our neighboring countries to buy their armored bullon cars and other needs from proforce in Nigeria than importing from abroad. All branches of our Military should as a matter of National security disband their Toyota/Ford(Hilux?Ranger) 4Wd’s for various variants of these Armored cars. Them fit dash d 4WD’s to Man o War them!!! Very impressive. Who says we cant be a Great Nation!!! Well thank God for all these insecurity everywhere..Necessity is the mother of invention!!! Is Proforce using underchassis and COTS parts from Toyota/other commercial vehicle manufacturer or do they develop their own? I see the size of the vehicle as somewhere near an SUV or pickup truck. I assume that the armor is light but effective enough for protection from small arms. I’m curious as well with the vehicle’s engine. This vehicles can be good for convoy escorts, base security, and patrol missions. It seems like a squad of troops can fit in the vehicle. Would be better than a soft-skinned SUV or pick-up. How about protection performance? I’m curious if the military or Proforce made some ballistics testing on prototypes, or placing a unit for an IED protection test? I believe the Boko Haram are using IEDs as well. They have been tested with ballistics from 30 metres out and explosives TNT-rated as a grenade-type blast. When the Minister Aganga visited, ballistic tests were again conducted under his watch. OMG!!! All i saw some of their products with some banks few months back when i was in the country, never knew the manufacturers are just 5miles away from where i grew up sagamu. Its good they involving Gateway polytechnic students in this. New vista beckons indeed. Do hope state govts. will replace the light skins they give the police n other security agencies with this. On the day, they were ‘uparmoring’ some SUVs for a multinational corporation in the consumer sector. They need FG patronage. Federal might will take them to a higher ground fastest. Glad for you to share the info. At least they already have experience in up-armoring civilian vehicles before, probably for the rich and VIP’s hehe! I was shown the bulletproof windshield of a client’s vehicle which was hit by AK47 fire on Carter Bridge in Lagos. It did not even penetrate half of the way through the glass. Now that the photo of the PF2 Mk.II has been posted (had to hold my aces :)) , it is appropriate to state that both vehicles under construction here are the PF2 Mk.II. The PF2 was the first to be fabricated in the APV line. However, further R+D has given rise to the improved PF2 Mk.II which is what they are apparently now concentrating their energies on without necessarily losing the ability to fabricate the PF2 base model. Within the premises, finished units of PF2 Mk.II APVs are visibly more numerous. From the PF2, an armoured combat vehicle has also emerged. 1) .IT IS VERY IMPORTANT THAT THEY GET F.G PATRONAGE. 2) Somehow they need to get LT. GEN . IHEJIRIKA AND the IGP ABUBAKAR TO visit their FACILITIES and arrange a live simulation. 3.) There is nothing stopping them ( proforce) for now as some companies in the states will do is to offer a loaner to the N.A. to be used in the North East FOR A trial period of 6 months so the the army can test it under live conditions. 1)we have to sell to neighbouring countries as well. 2) I know these vehicles are good, but we also need to keep doing research and tests to improve (the same way sony went from playtation one to playstation two). 3) this could really generate money for Nigeria and jobs for the youth. With all these graduates we produce every year, why don’t our graduates gather to create this kind of business ? This could make them the billoniars of tomorrow.